What usually comes to mind when you hear “worldwide medical technology leader”? The US, the UK, maybe Germany? Surprisingly, the position is occupied by neither of those—it’s Switzerland that’s currently the undisputed leader of the life sciences industry, a feat which has earned Switzerland the moniker of “Health Valley”, particularly popular in the French-speaking parts of the country. What drove Switzerland’s worldwide success? Below, I’ll be outlining some of the reasons behind its spectacular accomplishments, explaining why both the place and the industry are particularly worthy of your attention, and sharing some of the more impressive outcomes of the sector’s activity. Switzerland outstrips both Germany and the UK in the number of people employed in the medical technology sector, which in Switzerland accounts for 2.8% of the total workforce. Companies located in the most important medtech clusters in Basel, the Lake Geneva region, the St. Gallen–Lake Constance area, and around Bern, are issued around 1,200 patents every year. On average, these firms invest 13% of their turnover in R&D and sell 90% of their products abroad, accounting for more than 5% of Swiss exports. 2.2% of GDP spent on medtech—one of the highest results across the globe. Recognizing talent—during the annual Swiss Med Tech Day, the jury presents the most outstanding achievement in medical technology unveiled or showcased at the event with a CHF 50,000 prize. Industry support—several regional and national organizations and institutions provide support for the industry by creating networking opportunities and know-how exchanges, such as SIX Swiss Exchange or Osec. 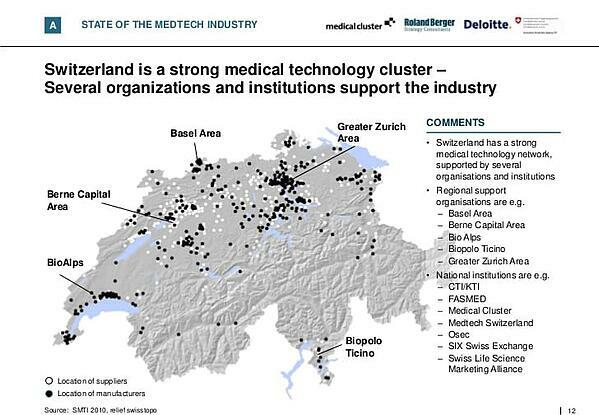 Source: The Swiss Medical Technology Industry Report – "MedTech at the Crossroads"
Over the years, Switzerland has time and again reasserted itself as the expert in the medical technology sector and made its mark with pioneering work in a number of other trailblazing fields such as artificial intelligence. The digital transformation that has been reshaping the healthcare industry will make ever greater use of AI in the future. Only last year, IBM deployed its Watson supercomputer to help quickly and precisely diagnose rare illnesses by scanning the patients’ medical histories, gathering detailed information through a surveys, and then converting the data into digital form. In light of this digital transformation, mobile health, fusing technology in a novel, innovative manner, seems particularly interesting (or we’re just biased on the subject). Did you know that roughly 30,000 mHealth apps are downloaded every day? They help patients, doctors and lifestyle app users on daily basis by making diagnosis, analysis, and treatment easier. IBDoc—a smartphone-based rapid test for people suffering from chronic intestinal diseases, allowing users to examine relevant samples at home and adjust the therapy accordingly. A special app converts the smartphone camera into a reader, guides through the user through the whole process, and delivers information regarding intestinal inflammation within 15 minutes. These two offer a small glimpse of the sprawling Swiss medtech market. But as a meaningful software provider, we couldn't support the development of the mHealth sector more. We’re looking forward to see what the future will bring for the Medtech Valley. Improve your users life by solving their burning health problems in a modern, better way. And do it with our developers and designers who know their craft.